Pioneers in the industry, we offer sand content kit from India. One of the primary functions of a drilling fluid is to carry drilled solids from the well bore. These solids are a contaminant, and if left in the system, can lead to numerous problems. The ofite sand content kit determines the volume percent of sand-sized particles in the drilling fluid. Api defines sand-sized particles as any material larger than 74 m (200-mesh) in size. The test can be performed on low solids fluids as well as on weighted fluids. 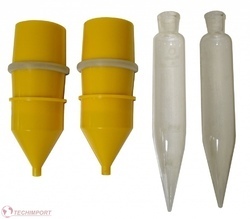 The kit consists of a glass tube graduated to read percent (%) by volume, a funnel, and a 200-mesh sieve contained in a cylindrical shaped holder. Consists of sand content kit, complete, with sieve, funnel, graduated tube, wash bottle & carrying case. Looking for Sand Content Kit ?